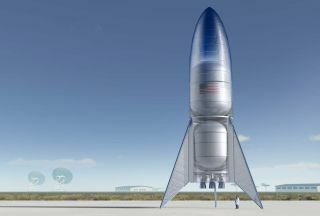 Artist's illustration of a prototype of SpaceX's Starship vehicle. Starship is designed to help humanity explore and settle the moon, Mars and other distant destinations. SpaceX continues to amaze in popularizing space exploration. Not only is it doing fantastic work in reaching and exploring space, shown by its efforts to transport supplies and astronauts to the International Space Station, it also flaunts retro exhibitions that capture the interest of people worldwide. Recently, Elon Musk — the CEO of SpaceX — released images and information on what he calls the "Starship" Hopper test rocket. The prototype hopper was recently constructed in a project that will hopefully be used to help colonize Mars. Anyone who follows Musk will know that he is a keen advocate of going to Mars, and with scientists and engineers urging everyone to get behind an exploration mission that can take us to a whole new frontier, it is now becoming more of a reality than a dream. Starship and its huge first-stage booster, Super Heavy — which together were formerly known as the Big Falcon Rocket (BFR) — could be the vehicles to undertake this important task. In order for Starship and Super Heavy to be successful, there are many things to take into account, and a lot of power needs to be exerted. This is not just another 384,400-kilometer (238,855 miles) mission to the moon. This is going to be a journey more than 140 times longer. This means that there needs to be enough food, supplies and protection from the harmful radiation of space in order to survive this journey, and even then there’s the question of how much fuel is needed to break free of Earth’s gravity and make it to Mars. Diagrams of SpaceX's Falcon 9 rocket (top) and planned Starship-Super Heavy vehicle (bottom). SpaceX CEO Elon Musk envisions the reusable Starship-Super Heavy duo helping humanity colonize Mars. These are the reasons why a voyage to Mars is a struggle. But nothing good ever comes easy. SpaceX has shown extremely promising signs of improved space exploration with the introduction of reusable rockets, and now Musk has released the first images of the Starship prototype that will soon undergo short "hopping" excursions to test its feasibility. These vertical takeoff and landing (VTOL) tests will hover up to 5 kilometers (3 miles) above the ground before landing back on Earth. The hopper prototype towers at a height of about 39 meters (128 feet) and has a diameter of 9 meters (30 feet), with a stainless-steel exterior starting at its pointy tip to its three rear "fins" that serve as its legs as it stands on the ground. Starship looks strikingly like something out of a 1950s science-fiction comic book, and that’s because it was modelled after one. Again, anyone who follows Musk will also know that he is a huge fan of cultural references in his SpaceX work. Back in February 2018, Musk tested the Falcon Heavy, in the process launching one of his sister company’s Tesla cars into an orbit around the sun. Inside the Tesla was Starman, a human-scale mannequin with SpaceX’s spacesuit, given its name after the 1972 hit song by David Bowie. In the case of Starship, the rocket was inspired by the 1954 adventure of comic-book hero Tintin in "Explorers on the Moon." Although Starship doesn’t have the red-and-white checkered appearance of Tintin's rocket, everything else is remarkably similar. This inspiration was confirmed by Musk at an event in September 2018, which he followed up by saying: "If in doubt, go with Tintin." Musk tweeted a picture of the prototype sitting at one of SpaceX’s factories near Boca Chica Village in Texas. Starship and Super Heavy will both utilize the powerful Raptor engine that SpaceX is still working on. It has been suggested that in June 2019 SpaceX will create the orbital prototype of Starship and connect it to the Super Heavy booster for improved testing. This project is sure to be an extremely exciting one to follow. Musk has outlined his ambitions to conduct two unmanned cargo missions to Mars by 2022, followed by a crewed trip around the moon and back as early as 2023; this latter mission will carry 43-year-old Japanese billionaire Yusaku Maezawa. Then, by 2024, SpaceX could be ready to conduct crewed missions to Mars. This will provide the platform for creating settlements on Mars, and science fiction will become a firm reality. After that, the possibilities are endless. Could Mars be the answer to problems on Earth? This article was provided by Space.com's sister publication All About Space, a print magazine dedicated to astronomy, space exploration and the night sky. Sign up for the All About Space newsletter for news and subscription details! Follow us @Spacedotcom or Facebook.